Delicate and fragrant, these koftas contain rose-scented water and harissa to produce an exotic flavour that’s perfect for a summer meal. Prepare and light the barbecue, or preheat the grill to high. Soak 6 long wooden skewers in cold water for at least 30 minutes. Warm the oil in a frying pan over a high heat. Add the shallots and fry for 5 minutes or until golden. Remove from the heat and add the cumin and cinnamon. Stir well to combine then set aside to cool completely. Place the mince in a large bowl. Add the cooled onion mixture, harissa, rose water and a pinch of salt. Using your hands, knead the mixture for about 3 minutes or until well combined and smooth. Divide the mixture into 6 even pieces. With dampened hands, shape each portion of mince around the prepared skewers until the mixture forms a 'sausage' about 17cm long. 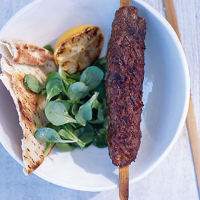 Barbecue or grill the koftas for 8-10 minutes, turning them with tongs 2-3 times during cooking. Serve immediately with salad and dollops of Greek yogurt dusted with ground cinnamon.